After six years of marriage, my husband knows not to get me the Orchid from Kroger on Valentine's Day. Now, don't get me wrong. Orchids are beautiful. I just don't have the delicate hands to keep them thriving. 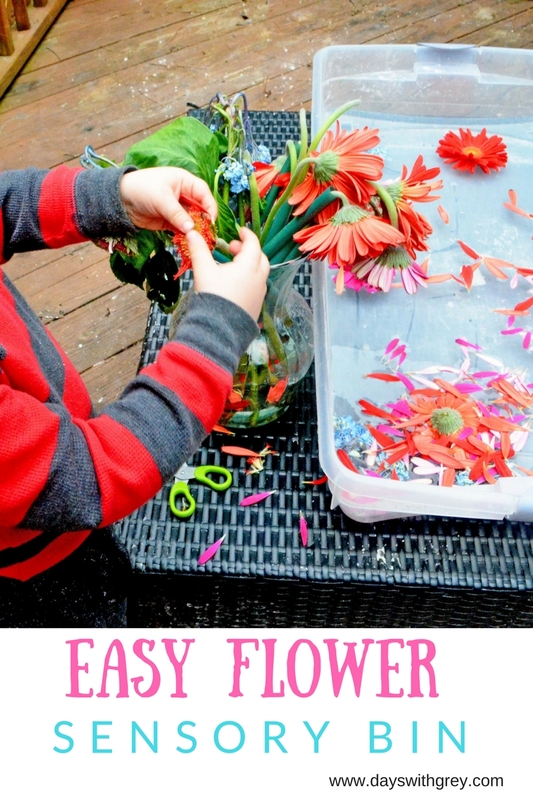 What better way to make use of those dying Valentine's Day flowers than to create a preschool sensory bin? This preschool sensory bin was an instant hit with my 2.5 year old. I poured water into our under the bed storage bin. Handed my 2.5-year-old the vase of flowers that he was already interested in. Handed my 2.5-year-old some safety scissors. Of course, stay close as your child uses the scissors. Make sure they are child blades with the rounded edges. Speaking of scissors, you will love Munchins and Moms new Year of Scissor Book. My 2.5 year-old wanted to know all about the different parts of the flower. "What's this part called, mom?" We kept this activity outside since it is warming up and the bin is filled with water. - no brainer, right? Typically activities with water result in a change of clothes. I didn't necessarily need my floors washed today. Pin This for You Next Flower Arrangement! Tired of Googling ideas and Pinterest? Our Alphabet Activity Cards will keep all of your favorite activities in one place.